Random Noodling: Poetry Friday--Welcome Poetry Pardners! © Diane Mayr, all rights reserved. The border, edited by me, is an illustration by Albrecht Dürer found in Of the Decorative Illustration of Books Old and New by Walter Crane (1896). It's interesting to note that on the top of the box are the words ratio vincit, which means "reason prevails." Have you got a cup of coffee ready? 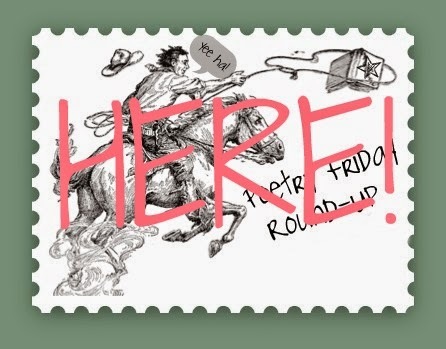 Settle in...and now, without further ado--the Poetry Friday Round-Up! Kurious Kitty (my alter-ego) is sharing a poem that was first published in 1892: "Blossoms." KK's Kwotes has a line from Larry Sawyer from his poem "Sundial." First up is my neighbor to the north, Matt Forrest, who shares two poems sent to him from a middle-school, and modeled after one of Matt's own poems! What an honor that must be! At Keri Recommends she's got a short poem "to match the short visitor" she has at her house. A bit cryptic...you'll have to click over in the morning. Robyn Hood Black shares more student haiku--this time, some award-winners from the 2015 United Nations Student Haiku Contest. Lucky Robyn--she's heading off to a Haiku Society of America meeting/conference! At Jama's Alphabet Soup, she's looking at a book titled Cool Melons--Turn to Frogs! : The Life and Poems of Issa by Matthew Gollub. It's one of my favorite haiku books for kids and I'm sure you'll like it, too! Her post will go live in the AM. Tara at A Teaching Life talks about the preciously short time of year that is lilac time. She shares a poem by Alice N. Persons on lilacs and the power they have to lead a person to thievery. Penny Parker Klostermann has two guests today participating in the "A Great Nephew and a Great Aunt" project--Michelle H. Barnes and her daughter, Miranda. Check out the awesome art work of young Miranda! I love the bird! With her original poem, "Sequoia," Joy tells us the story of the Cherokee man who brought reading and writing to his people. Head over to Poetry for Kids! There's a gorgeous photo of iris at Friendly Fairy Tales, and Brenda's sonorous rain poem is a delight! Laura Salas has another of her "poetryaction" poems written in reaction to another poet's work. Today she has "A Train Is..." in response to Rebecca Kai Dotlich's All Aboard. Ever think that poetry and kindergartners don't mix? Becky Shillington proves otherwise today at Tapestry of Words! At Today's Little Ditty, Michelle has posted another entry in the Nikki Grimes wordplay challenge. Read Penny Klostermann's playful poem, "Shadow." Sally Murphy shows us a great, and useful, Mother's Day gift she received, AND, she shares the well-shared poem, "The Owl and the Pussycat" that inspired the gift. April Halprin Wayland has a LOT going on at Teaching Authors including an introduction to a new picture book by Barbara Bottner, Feet, Go to Sleep and poems by Barbara and April. I would like to invite all Poetry Friday writers to write for the new gallery, Spring's Symphony, that I am designing, if interested. There is no rush. I will post the gallery at the close of the spring season. (The invitation was at last week's Poetry Friday post: http://beyondliteracylink.blogspot.com/2015/05/may-blossom.html). Thank you, Poetry Friday friends. I forget how much time is involved in this round-up business! Excuse us while we take a minute to wash up! Kahlil Gibran was all the rage (if there can be a poetry rage) when I was in college in the 70s. At Gathering Books I am reminded why. At My Juicy Little Universe, Heidi tells us of her daughter's 10th grade poetry project on Natasha Trethewey. I get a hollow feeling just remembering those days of projects. These days, the hollow feelings are all of my own making--why, why, why, do I get tangled up in multiple projects? I've got the radio on in the backgrounds and all I've been hearing about this morning is Johnny Depp's dogs! And this is on public radio! Yikes, no wonder the world is in the mess it's in. Oops, sorry for that little editorial comment in the middle of the round-up. Note to self: stay on task. You're in for a treat when you visit Tabatha Yeatts: The Opposite of Indifference. She has an original poem inspired by a poem from Langston Hughes. She also invites readers to contribute their own. Mary Lee has a Robert Frost poem today. Up the road from me is Frost's Derry farmhouse. The golden greens are at their height! Margaret Simon has created a poem of simple peace. There's nothing more I can say--just read it. Irene Latham's Dear Wandering Wildebeest was inspired by the photos of Greg du Toit. Visit Live Your Poem and you'll understand why. The Logonauts are writing about waiting...and waiting...and waiting X100 for their book club books to arrive. Dori Reads has an incredible poem that requires some manipulation of the reader's voice! She also shares links to royalty-free photos which we blog-types will find helpful. At The Poem Farm is an original poem that Bert, of Ernie and Bert fame, would love! There's a lot to see and hear on Amy's blog today! Many of us signed up for the Silver Star Elementary School Poetry Project, organized by Jone MacCulloch for NPM. At Mainely Write, Donna shares the poem she received from a fifth grader. We find another Robert Frost poem today posted by Little Willow at Bildungsroman. It is nothing like the poem posted by Mary Lee. Frost was definitely not one dimensional! Jan at bookseedstudio has a double treat--art and poetry! More specifically, a pantoum by Kristine O'Connell George from a book pairing art and poetry--Heart to Heart compiled by Jan Greenberg. Have you ever heard of a "poetry blitz"? You can see photos at Pleasures from the Page. Oh, to be a student again! Reading to the Core shares an Emily Dickinson poem that has some BEE-yu-tee-ful lines! Read and see if you don't agree! Reading, Teaching, Learning's Holly has a poignant poem about a place that has nurtured many futures--Miami University (in Ohio, not Florida). Anastasia Suen introduces some of us (me) to Birthday Rules, a new book by Laurie Friedman. Sylvia Vardell, co-editor with Janet Wong of the Poetry Friday Anthology for Science, has an excerpt from an article of theirs that recently was published in ALSC's Children and Libraries. It's chocky-block full of suggested books and magazines. Talk about ironic titles--Karen Edmisten has a poem by Carl Dennis called "To Happiness." Run right over to readtotz to enter the drawing for a copy of The Poetry Friday Anthology for Celebrations! And check out the poem card made from Lorie Ann Grover's poem, "Selfie." I'm going to indulge in a little lunch and come back later to catch up on any late-comers. Jessica Bigi has a lovely flower photo to share. Here's what Laura Shovan had to say this evening (it's now 9:00): "I'm super late for Poetry Friday, but had to share my third grade students' Simile Zoo. We've been working on animal simile poems. You'll find links to the full lesson, plus monsters, penguins, sloths, and a lovely momma cat at Author Amok." It's never too late to join the party! Just checking in is Cathy from Merely Day by Day with an original poem about bird watching--who's doing the watching? I can definitely identify with those "signs," Diane! Thanks for hosting. I'm having computer issues (as in, it won't work at ALL), so I'm stealing some time on my wife's machine. consequently, I may not be able to visit many blogs tomorrow, so I apologize to everyone in advance! So sorry to hear of your computer "issues." Use the time away to get outside and enjoy this crisp fall-like weather we're having! Hi friend! Thanks for rounding up the herd this week. I have a short poem to match the short visitor in my house at http://wp.me/p4P49X-c0. Link goes live in the wee hours! Happy hosting! Glad to hear it! Dizzy, Dot, Trixie, Henny Penny and all the unnamed chicks are cheering for you! The emphasis has shifted from chickens (have you noticed the plethora of chicken books over the past few years?) to a more diverse feathered population! Ha! I will claim poetic/artistic license for myself, thanks. Love the art, too - big fan of Dürer (& Crane as well). Can I say how jealous I am that you're off to a HSA meeting? Have fun! You can. And of course I'll send good haiku vibes your way! Thanks. My link goes live at 6 a.m. EDT. Thanks for hosting, Diane!! 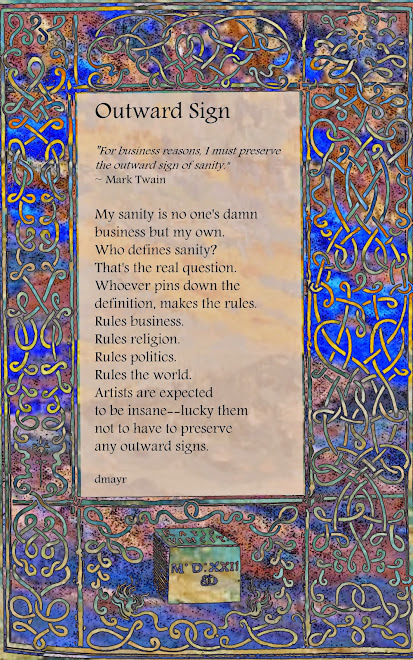 The insanity poem hasn't been shared before, I plucked it from my virtual filing cabinet. Chi chi dango? I don't know what a mochi snack is, but I sure like saying its name! Great choice of poems for today. The lilacs here are just coming into full bloom. What a wonderful poem. I love that artists have an excuse :-) Thanks for hosting. I have collaborating guests, Michelle Heidenrich Barnes and her 12-year-old daughter, Miranda on A Great Nephew and a Great Aunt today. My link goes live at 4 am CST. Thanks for gathering this delightful pair! I'll be in with an original poem and a poetry prompt at www.poetryforkidsjoy.blogspot.com Thanks for hosting us, and I love the idea that artists can be insane--great poem. It is a fun one to walk around in and I like the Mark Twain quotation. I love Mark Twain quotes! He was so wry. No rain here, but we don't require watering yet. I love the photo on your post with the droplets on the iris. Hi Diane, I'm from a family full of diagnosable mental health issues, and sometimes I feel way too rational to be a poet. Like I need to be more unconventional or have a good dollop of insanity to truly be artistic. Weird, I know. Poetry requires nothing more than a keen eye, an imagination, and a good ear! Your poem is *perfect* as usual, Diane! I had to read this about five times and let it sink in. It is a good reminder to be true to yourself and not worry what others think, artist or not! I am so excited about my latest Poetry Friday post--this week I am sharing about a recent poetry reading and writing adventure at a local elementary school. Thanks for your kind words, Becky! I enjoyed reading your poetry lesson. Sanity is overrated. That's is all. A fun poem for the imagination and the ear with it's "runcible spoon." Barbara Bottner's Zoo Song was a favorite back when I was a children's librarian. I look forward to seeing her newest! I'm a big lover of quotes, so thanks for sharing them, Carol! That's because it's the first time I've posted it! I'm glad you like it. Good morning, Diane! I'm noodling today on the work of Natasha Trethewey, inspired by my 10th grader's English project. As she would say, "The more you know..." She may be struggling a little with the assignment because she's awfully darn sane, my daughter. : ) Thanks for hosting! That sounds like an intense project for 10th grade! Luckily, she has you to bounce things off of. I like the form of the two poems and would enjoy seeing more. I love your poem, and especially the way it works subtly with the border/background. Layers of meaning. A perfect poem for today in New Hampshire! Enjoy your upcoming visit--it sounds heavenly. What a gift you received--twice! Today my third graders and I are celebrating book orders, and I am sharing a series of haiku by a student about the anxiety of waiting for book orders to arrive. It was fun to decipher the handwriting! Sorry Jessica, but there are a number of Jessica Bigi pages on FB. Do you have a link? I'm glad you've stopped by! Jessica, I cannot find any stories, poems or artwork on your Facebook page. I am on the right "Jessica Bigi" page, but don't know where to look, I guess. Jessica, I didn't have any luck either, so I will just post the very lovely photo you have as your Facebook cover. Here's to our sanity. Thanks for hosting, Diane. I have a Vachel Lindsay poem, as well as a list of resources for royalty free photos at DoriReads. Let's hear it for all kinds of insanity. Rules Schmules! Thank you for this poem - and its beautiful border! Today at The Poem Farm, I have a pigeon poem and a Poetry Peek! Thank you for hosting... xo, a. Rules, if one understands the reasons behind them, are meant to be broken! I would like to invite all Poetry Friday writers to write for the new gallery, Spring's Symphony, that I am designing, if interested. iThere is no rush. I will post the gallery at the close of the spring season. (The invitation was at last week's Poetry Friday post: http://beyondliteracylink.blogspot.com/2015/05/may-blossom.html). Thank you, Poetry Friday friends. My postcard poem from a student of Jone MacCulloch's today. As a result of the shared poem you made some fond memory connections. A definite bonus! A wee bit dark. I tried to comment, but I'm not sure it went through. I had to jump through a bunch of hoops to do it! Your previous woodchuck Haiku & image is great good fun, Diane. Appreciations also for reminding me of this M.T. sanity quotation & for your take on it, which I like. Bookseedstudio/Jan Annino shares lines from a Kristine O'Connell George pantoum & accepts a pantoum challenge. Plus she shares an artist's easel outdoors in Apalachicola, with Cynthia Edmonds. Thanks so much for the hosting! I can't wait to see the baby chucks when they arrive! It's always a highlight of my summer! is the link I forgot to add in, above. tnx! Love your poem and it's beautiful presentation. Especially love the cat at the end! Recapping some of our poetry month fun with pictures! Love your poem, Diane, and that gorgeous border! Thanks so much for hosting today. I'm reading Emily Dickinson and dreaming of long summer afternoons this week. I'm not rushing summer--we've finally have spring! I'm sure you'll find plenty of reasons to visit your old alma mater. Thanks for hosting, Diane! Love that "Artists are expected to be insane" line! Thanks for the recommendation! I'll write up an order card for the library on Monday. Some great suggested titles! Thanks! Thanks for hosting, and I'm in this week with "To Happiness" by Carl Dennis. It's here. Nice choice of poem, Karen. Unexpected. The Pigeon Dance! Thank you! At readertotz, we have a #Giveaway in the collection we are both in: A Poetry Friday Anthology for Celebrations. Thanks for all the work today. What a turnout! Yes, we are! Congrats to everyone in this great resource! Hi Diane. I meant to tell you how much I like your PF "postage stamp" up top. Cute design! Your conversational way of presenting the roundup is always a treat as well. Just noticed, though, that your link to Joy Acey's post needs fixing. Thanks, Michelle, I fixed it! Hello, dear Diane. Thank you for hosting. I love seeing you on your personal freedom soapbox today. I'm super late for Poetry Friday, but had to share my third grade students' Simile Zoo. We've been working on animal simile poems. You'll find links to the full lesson, plus monsters, penguins, sloths, and a lovely momma cat at Author Amok. Glad you could make it! There's plenty of room on my soapbox for two! Thanks for hosting, Diane. I enjoyed your poem. I suppose we're all a little crazy. That's what keeps the world interesting. Cathy, it looks like you're going to round out the round-up. I'm heading off to bed, and a book.